What, no mention of the great Goldeneye? I'm with you on 1998, it was my favourite gaming year in history. I weep for those who didn't get to experience its glory. '98 also definitely my gaming 'Golden Year'. Ocarina, Banjo, Goldeneye (I think it was also the year I actually got my 64 and therefore Mario). 2000 people is a pretty poor pool to draw from. As far as my own personal 'Golden Year', I haven't even kept track of when the games I like were released. Certainly seems too hard to pin down any particular year as being 'the best'. I don't know about choosing a particular year. That seems like a pretty brief window for a golden age. However, I would agree that the second half of the 90s was a good time to be a gamer. Between the playstation and the 64 there was some great stuff. Mario 64 is still my favorite Mario and I will always remember the first time I saw the battle of Hoth in Shadows of the Empire on my friend's ridiculously huge TV. Good times! For me, though, it would probably have to be 1995. Command & Conquer, Mechwarrior II, Warcraft II, Chrono Trigger, Heroes of Might & Magic, Kirby's Dream Land 2, Seiken Densetsu 3, Worms, Dark Forces, Transport Tycoon, Yoshi's Island... A lot to love there. Yeah, that list is all over the place. Not necessarily wrong, there were indeed great games in those times, but they way they are spread out randomly in different decades is a bit strange. Also the way that there seems to be a very narrow margin between each entry on the list. Nothing is really taking precedence. I guess it means there isn't really a single "golden age". People have their own golden ages and there isn't really a single one that everyone agrees on. Ehh not everyone is going to remember EVERY game on the top of their heads which honestly sounds like what the whole survey was probably based on. What can 2000 individuals remember about video games. Wouldn't surprise me on the other side of the coin if the years they had a choice from only had some individual examples and not having a database of all games and top sellers listed for that year. Always takes two to tango and either people couldn't remember the games which is fair or the survey didn't give that massive catalog or high selling games for that year. Let's face it, the late '90's were great for gaming. For those interested in fighting it out between any given years, knock yourselves out. In my opinion, 1999 was a very fine year: AoE II: The Age of Kings; Sid Meier's Alpha Centauri; Ape Escape; Chrono Cross; DoA 2; Legacy of Kain; Resident Evil 3; Sim City 3000; Worms Armageddon; Silent Hill. Especially if you are going to claim that "Britain" is doing it. "British Poll says", fine. The numbers make it unimportant, but it's still true. "Britain says"...no, that's a lie. Yahtzee was right, the greatest game ever was made when you were 12. In other words, Nostalgia rules all...even me now that I think about it. 1993-2004 is the range I reserve. So, so many great games. A period of huge growth. After 2004, there's still plenty of great games, but the gains were slowing down rather quickly. And now...we're up to our necks in sequels. The indie scene still has great ideas though and now, the means to bring those ideas to fruition without getting stomped into a mudhole by the economic and technical might of publishers. Wish I had known about this ... actually I don't, the choices to be made! If it had been less single year and more 5 year or decade choices then ok but to define a single year as THE golden age of gaming? Oh boy! Wait comrades, don't forget 2012 with CODBLOPS2! i may be wrong but i don't think PC gaming (and internet use) or the N64 had as high penetration in Britain as perhaps they did in the states at that time. however, as i remember it, "everyone" had a Playstation circa 1998. the PS1 was considered very cool...especially by people of an age to be "clubbers" and the dance music (or "rave") scene was huge in the 90s in the UK. God, yes. I'm torn but think 96 might just get it overall, when was Doom 2? Saying that the early 90s had a literal ton of Amiga games I'd consider some of my personal favourites that are still exceptionally enjoyable to this day. It's more than most adverts use in their claims anyway. Also, Mario's nose has not aged gracefully. It's not all nostalgia though, for me the golden age lasts too long for that. Basically from 94-99 we had some absolutely classic games (I was 13-18 at the time), and gaming as a whole went through a revolution (2D to 3D), which doesn't happen very often. That period of the SNES-PS1-N64 will never be topped IMO. Maybe if virtual reality (or maybe use augmented glasses tech somehow) gaming takes off, I dunno. I have to say though, this generation has been pretty good so far as well. Working on my backlog, I'm currently having my first playthrough on Mass Effect 2. It is bloody amazing. Rarely do I find myself thinking about a game while at work nowadays, but this is def one of them. 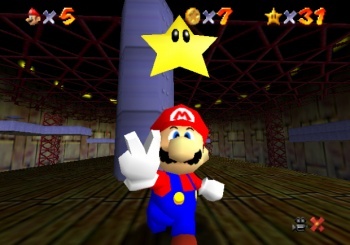 Mario 64 was the best game ive ever played. I love the list, I loved Halo Combat Evolved, Elder Scrolls and Vice City as well. Great list id say! I couldn't decide by year. I will always say it's between 1995 and 2005. There were so many games released in that time that really accomplished a lot and unfortunately a lot of those games aren't remembered as well as the repeating franchises. In fact there were so many games talked about around my school at the time it was impossible for me to count them all. Literally more than enough games to cater to every different gamer (and me), and most of the designs in these games were pretty original too, and even special projects like Mugine swept the net. Yahtzee has a point with the PS2, the library of good quality games on it is overwhelming. Looks about right. Interesting. It looks like a 'Golden Year' happens about ever 5-6 years. Atualy, it's 5 then 6 then 5 then 6 Which means one should have been been 2002+5 -> 2007 and the next one should be happening this year. Really, since I've been gaming for close to 24 years, it is hard for me pin point a golden year. I would say the time period of when gaming felt truly special and I had no problems with anything would be from the NES area to the N64. The Gamecube for the most part was pretty magical for me as well, it did bring to me what I consider the best Zelda game and that is Wind Waker. I was a Nintendo gamer until about 4 years ago when I finally caved and got an XBox 360 because it was what all my friends had. Before that I had to split screen with them, and on rare occasions they had me bring over my Wii for shits and giggles with Wii Sports. That was a good year, I didn't play alot of those games but I remember people in the early-mid 2000s being 'happy' on the most part. It was 2002-2005 for me, thats when the Gameboy/Gamecube were ruling my life, happy times. It was also around this time I got a Playstation 2, wasn't very mainstream, you guys proberly never heard of it. Which means one should have been been 2002+5 -> 2007 and the next one should be happening this year. 2002-07 were mine, without a doubt. This but it also coincided with the first year of University for me, it was epic. I agree with this. Had they said "Golden Year" I'd accept it more. Still, hard to argue with the line '96 had. N64 is still tops in my books!